Whether you’re preparing for a summer pool party, a picnic or you’d just like to add some zesty flavor to your vegetable tray, this ‘quick and easy’ dip is the way to go. Why buy a grocery store dip when you can make your own at home – in less than 5 minutes! 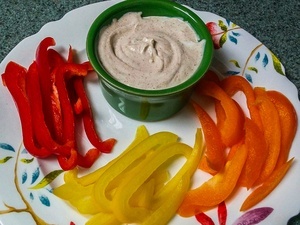 Here’s what you’ll need to prepare this Perfect Pepper Partner Dip. This quick and easy recipe offers great flavor when using ANY of our low salt or salt-free seasonings. Heads up – If you are on a low salt diet, keep in mind that this recipe contains 33 mg of sodium per serving (1 T). 1. Combine the sour cream, mayonnaise and 1 tablespoon of your favorite Sensational Seasonings in a small, serving bowl. Use a spoon to mix and blend the ingredients together (approx 1-2 minutes). 2. Sample your dip to decide if you’ll need to add another tablespoon of Sensational Seasonings for even more flavor. That’s the great thing about making your own dip – you get to decide what tastes good to your palate while taking control your salt intake at the same time. Tip – You won’t need to add any salt to this recipe unless you are using our Sensational Seasonings, salt-free Pork Rub. Although, if you’re on a low-salt diet, I’d recommend using 2 tablespoons of Pork Rub for flavor without adding additional salt.